I put my 351C 4V in my 31 Model A coupe about 30 years ago. Got married, raised kids, blah blah blah, and it sat for 15 years in the garage, buried under crap. Only occasionally dug it out to start it. Recently retired and decided its time to go thru and freshen the engine. Basically doing an inframe, as I have no means of pulling the engine now. Anyway, got the heads off and started looking around, cleaning, etc. and notice that there are holes in the intake chambers. Three in one head, and one in another. As far as I can tell, when the machine shop installed the screw in studs, they went a little too far, as that's where the hole goes. (I pulled the studs, and I can see the hole at the bottom.) I can't imagine that I didn't see that 30 years ago, so it got me to wondering how they would otherwise get there. 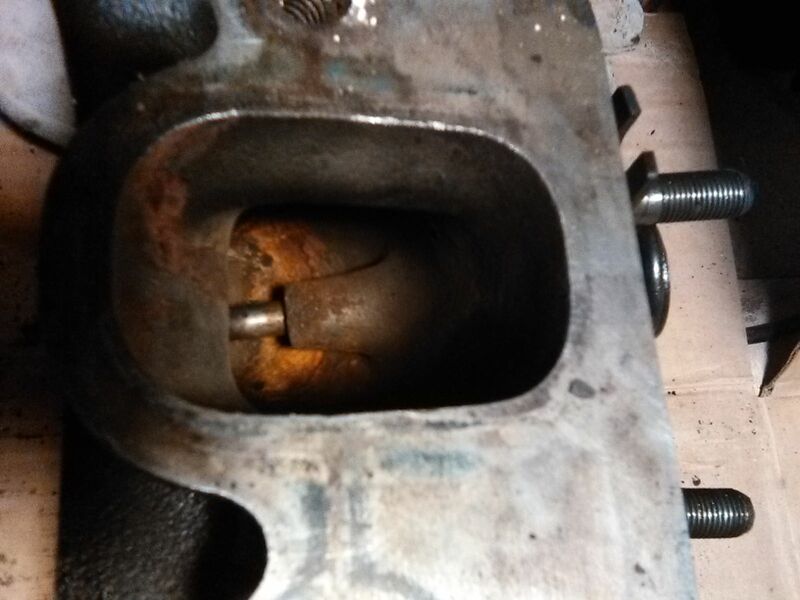 Add to that, the fact that there is a rust spot inside the chamber on one cylinder, near the valve. The engine had antifreeze in it the whole time, so is it possible that the hole for the screw in stud is in part of the water jacket, and somehow rusted through ? 69 Triumph TR6 w/ 289 W & C4. Normally when rocker studs go through, we just put thread sealant on the studs and go on with it. I tried to originally post a picture, but apparently failed. (it shows up as (img, img). I used the "choose file" to grab a picture. What is the right procedure ? Thread sealant may account for why it took about 80 lbs of torque to unscrew the stud. I use an image hosting site to post pics here. Flickr has been my poison of choice lately, since Photobucket turned redcoat on us all. Well, nosed around in Flickr, but got nowhere. I guess the holes can stay. Moving on to next issue. 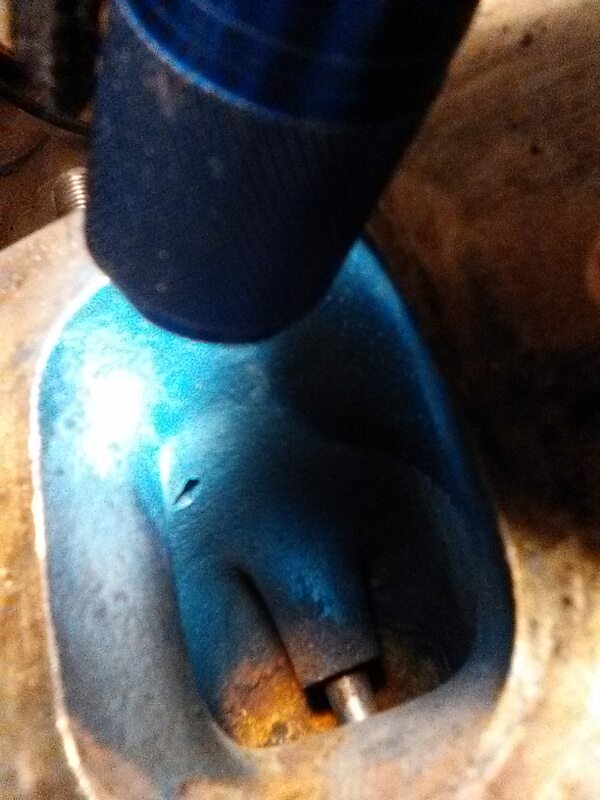 Two intake valves, so far, have pitting where the valve seats. If I buy new valves, do they have to be machined to fit; or can I just replace? Or do I need to start a new thread? and are the single groove retainers direct replacements ? The valve angles have to match whatever angles that are on your seats. If the seats are pitted, then they would need to be touched up. I would replace them with single groove stems. I ave some extra "super long" ( coarse thread end) Manley rocker studs. Long enough to protrude into the ports and allow you to grind them to the port shape. Originally sold for GM aluminum heads which had a habit of breaking stud bosses when a standard stud was used. Let me know if you want some. Just to clarify, the valves have the pits. The seats in the heads, (so far) look OK.
Are the stock valves bad enough to warrant replacing all with stainless anyway, since the heads are off? I'm not TRYING to spend money, but I would hate to tear it apart again down the road. In other words, is stainless that much better? The factory multi-groove stems have a very bad reputation for breaking. New Ferreas are cheap enough that it would be a strength benefit and a flow benefit for you. A Dremel doesn't have the power to really carve on cast iron. You need an air or electric die grinder.